Modern DesignersIs this your style? Accessorize in style with the Charles David Bracelet sandals. Sumptuously soft suede or shiny metallic leather upper in a strappy slingback platform dress sandal style with a round open toe. Wide suede or leather side straps wrap over a matching center ring crossing at the front ankle and wrapping through dual side quarter straps to an adjustable side buckle closure. Leather lining and cushioning insole leather outsole. 4 1/4 inch wrapped heel. 9.00 oz. A retro platform wedge is complemented by three wide straps in a color to match detail on the heel. Bungee elastic attaches to the slingback strap for a customized fit. The Vince Camuto Niskera looks hot with white denim and a waist-tie button down. A skyscraper wedge with a braided jute bottom provides an instant pick-me-up. Luscious leather crisscross straps and a covered slingback strap offer a fabulous retro vibe. Add it to an ensemble with drawstring shorts or a slinky maxi. The sky s the limit when wearing the decadent Franco Sarto Land slingbacks. Rich suede upper in a dress slingback style with a round open toe. Curvaceous vamp features contrasting leather overlays and an open inner arch. Heel sling strap with an elastic panel for easy slip on. Smooth faux leather lining and cushioned insole. Wrapped dress style midsole. Smooth outsole and coordinating 1 3/4 inch tapered low kitten style heel. The Luna Sandal features a metallic braided slingback strap with atonal Havaianas logo for a stylish look and extra secure fit. Comfort comes courtesy of our signature textured footbed. An alluring slingback sandal with sharp geometric cutouts. Full-grain leather. Leather lining. Rubber outsole. Leawood-wrapped heel. Opanka hand-crafted construction. Heel Height: 3 1/4 inch. Create a sleek and fresh look with the Sbicca Calynda sandal. Genuine leather upper features light embossing. Slingback strap with adjustable buckle closure. Open toe leads to a triple strap silhouette. Man-made lining and footbed. Stacked block heel. Manmade sole. Prepare for fun in the sun with the Camilla wedge sandal from Sbicca. Cotton pique upper. Slingback strap with adjustable buckle closure. Open toe. Synthetic lining. Double padded footbed. Textured platform and wedge heel. Synthetic sole. Made in the U.S. The Iness platform sandal is perfect for beach bonfires, weekend brunches or a night out on the town. Faux leather upper. Slingback strap with buckle closure. Peep toe leads to wide crisscross straps. Man-made lining. Double padded insole. Wood-like platform and heel. Man-made sole. Ralene Luster Strappy Slingback - made with multiple woven straps of black raw-edged leather, this women~s sandal from the Clarks Artisan Collection features a buckled slingback strap and leawood block heel. Smooth synthetic and leather linings, an OrthoLite footbed, and rubber outsole cushion each step. Smart enough for date night, the Ralene Luster is covered up enough for the office. Fastening Riptape Upper Material Leather Sole Material Rubber Lining Material Synthetic Technology Cushion Plus Heel Height 2.75 inch. Sarla Cadence Slingback - perforated black nubuck upper with multiple geometric designs to spark extra visual interest plus an ankle strap for added support. Soft leather or nubuck linings create extra comfort for the foot, while Clarks Cushion Plus Plus technology softens every step. End Uses Holiday Casual Upper Material Nubuck Sole Material PU Lining Material Leather Technology Cushion Plus Heel Height 0.75. 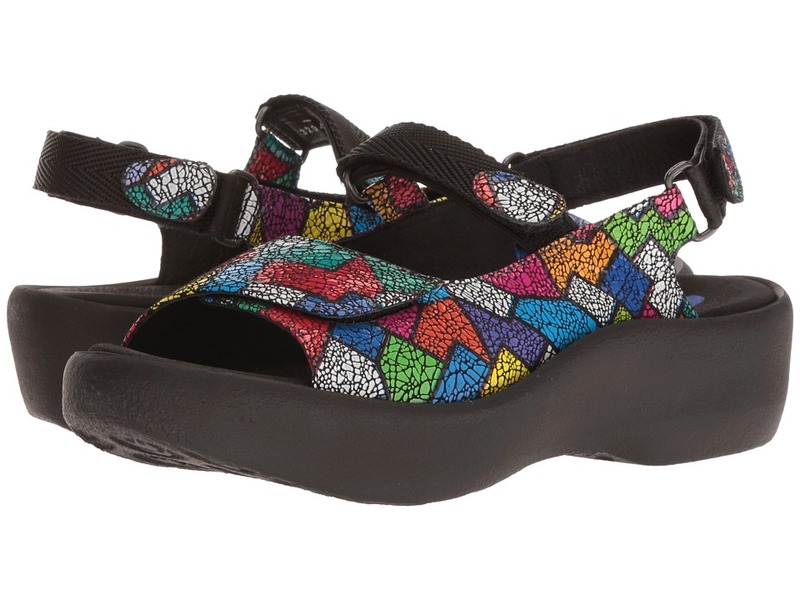 Polka dot cutouts perforate the beautiful full-grain leather on this casual but classy clog. Wear it with your favorite sundress and a bright pedicure for a day or night out. Graphic texture defines this charming peeptoe slingback. Sophistication and style! The Ames sandal from Charles by Charles David has a unique overlay wedge and hooded styling that stands out from the rest. A wrapped wedge adds to the sleek, cohesive look of a sky-high sandal with a slim slingback strap. Elevate your warm-weather strut in one of the seasons hottest go-to shoes. Wide crisscrossing straps and a slingback top a summer-ready sandal lifted by a 1.5 inch platform and 4.5 inch heel with golden detailing. Adjustable ankle strap with buckle closure. The Karenna sandal is from the Naot Scandinavian Collection, which runs as a Medium width. Flexibility, femininity, and flair. 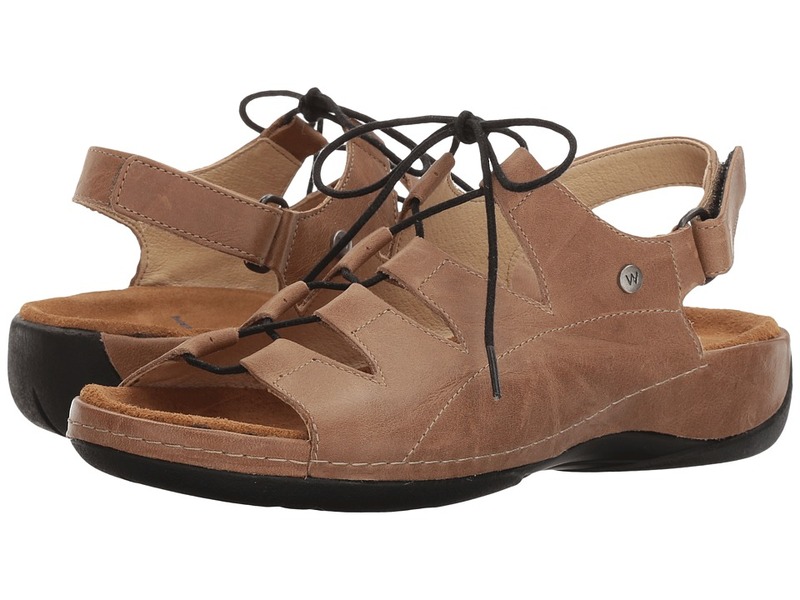 Nestle into the softness and luxury of Naot shoes and sandals. Rich leather upper with hook-and-loop closures for a personalized and secure fit. Removable suede-covered footbed absorbs moisture to keep your feet dry and fresh. Flexible rubber, polyurethane, and latex sole provides long-lasting wear and non-skid traction. Feel the relaxation envelop your being as you slip into the natural fit of Naot~s stylish women~s footwear. Imported. Measurements: Heel Height: 1 1 2 in Weight: 8 oz Product measurements were taken using size 38 (US Women~s 7), width M. Please note that measurements may vary by size. Weight of footwear is based on single item, not the pair. The brand suggests ordering a full size up as this style runs small compared to traditional European sizing. Style and comfort come in rare form and is made possible with the Jewel slingback mary jane from Wolky&amp#174. Offered in a variety of leathers, the Jewel offers a hook-and-loop closure system to ensure easy on and off. Soft leather lining keeps feet feeling comfortable and dry all day long. Removable anatomical cork and latex footbed massages the foot with each and every step. Polyurethane outsole ensures lightweight durability on a variety of surfaces. The Jewel is accepted by the American Podiatric Medical Association. Imported. Measurements: Heel Height: 1 3 4 in Weight: 12 oz Platform Height: 1 1 4 in Product measurements were taken using size 40 (US Women~s 8.5-9), width B - Medium. Please note that measurements may vary by size. Weight of footwear is based on single item, not the pair. Add an edgy, contemporary look to your wardrobe with the Kite sandal from Wolky&amp#174. Smooth leather upper with a lace-up closure and slingback hook-and-loop strap for easy a comfortable fit. 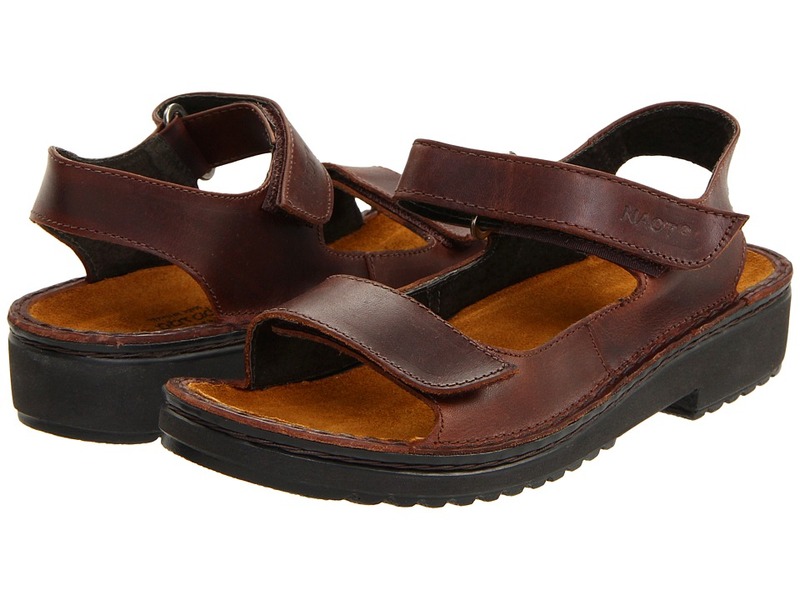 Soft leather lining and leather-covered footbed for breathability and comfort. Lightweight memory foam construction offer instant gratification and foot soothing comfort from the first wear. Durable rubber outsole. Imported. Measurements: Heel Height: 1 1 2 in Weight: 9 oz Platform Height: 3 4 in Product measurements were taken using size 40 (US Women~s 8.5-9), width B - Medium. Please note that measurements may vary by size. Weight of footwear is based on single item, not the pair.